Percentages are merely parts of a hundred. 82 percent, for instance, is simply 82/100. Figuring the percentage of a whole number is pretty straightforward. Write the percentage you want to find in the form of a fraction. The percentage you want to find will be the numerator and 100 will be the denominator. 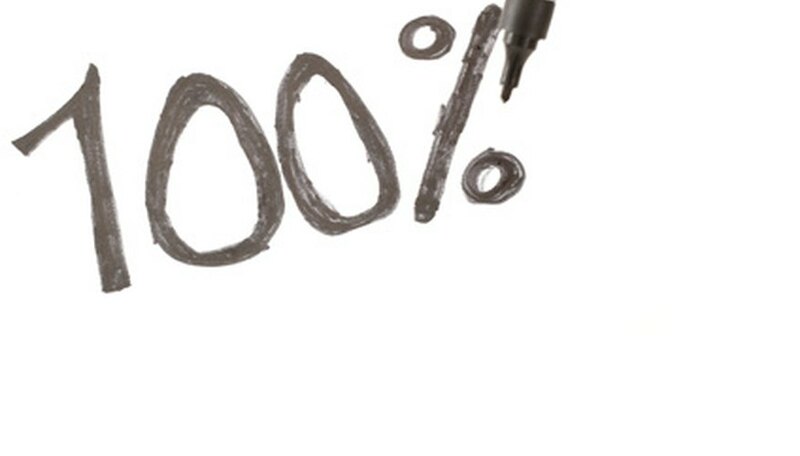 If the percentage you want to find is 50 percent, for instance, then you would write 50/100. Reduce the fraction to its lowest terms by dividing the numerator and the denominator by the greatest common factor . For instance, using the same 50/100 in step one, divide the numerator and the denominator by 50, the GCF. This would reduce to 1/2, which is 50/100 in lowest terms. Multiply the fraction written in lowest terms in step two (1/2) by whatever your whole number is. This would give you your answer. Use 160 as the whole number, for example. Multiplying 1/2 (from step two) by the whole number 160 gives 80. Sanders, Brenda. "How to Figure a Percentage of a Whole Number." Sciencing, https://sciencing.com/figure-percentage-whole-number-2364112.html. 24 April 2017.